About three-in-ten Asian-American eligible voters have cast ballots in midterm elections since 1998, a much lower turnout rate than that of whites and blacks, according to a new Pew Research Center analysis of Census Bureau data. With an estimated 9 million eligible voters in 2014, the Asian-American electorate for this fall’s midterm elections makes up 4% of all eligible voters. By contrast, Hispanics—the largest minority group—today make up 11.3% of all eligible voters. In the run-up to the 2012 president election, some analysts called the Asian-American electorate a potential swing vote, despite its relatively small size. In 2010, Asian-American voter turnout was 31%. That’s about the same as the turnout among Hispanics, and far below blacks (44%) and whites (49%). Turnout lagged even though the level of education and income of the Asian-American electorate, as a whole, is higher than for whites, blacks and Hispanics. Research has shown that, among all adults, people with higher levels of education and people with greater income are more likely to vote in U.S. elections. This is true of Asian Americans as well. Nonetheless, among the college educated, Asian American voter turnout (40%) lagged behind that of whites (64%), blacks (57%) and Hispanics (50%). This is despite the fact that some 47% of Asian-American eligible voters in 2010 had a college education, a rate higher than for whites (31%), blacks (18%) and Hispanics (16%). 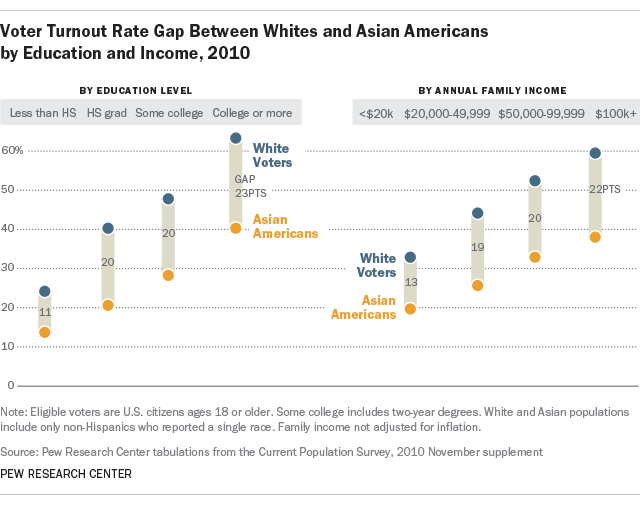 The voter turnout gap between Asian Americans and other groups narrowed among those who have not completed high school. We found a similar trend among Asian Americans of higher income – their voter turnout also lagged behind whites, blacks and Hispanics. A greater proportion of Asian-American eligible voters in 2010 had annual family incomes of $50,000 or more than did whites, blacks or Hispanics. Among Asian Americans, those with this income level made up 62% of eligible voters and had a 35% turnout rate. Among whites, those with this income made up 54% of eligible voters and had a 55% turnout rate. 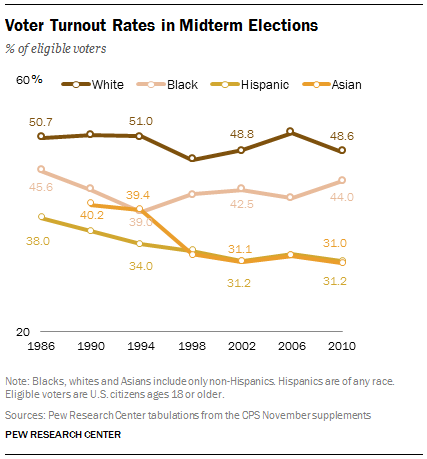 So, why the lower voter turnout among Asian Americans? Among registered voters who didn’t go to the polls in 2010, Asian-Americans were most likely to say they were too busy to vote. About 37% of Asian Americans chose “Too busy, conflicting work or school schedule,” as a reason for not voting, compared with about one-in-four Hispanics, whites and blacks. Asian Americans recently passed Hispanics as the largest group of new immigrants to the United States. The diverse Asian-American population claims roots in dozens of countries in the Far East, Southeast Asia and the Indian subcontinent. The six largest groups by country of origin are Chinese Americans, Filipino Americans, Indian Americans, Vietnamese Americans, Korean Americans and Japanese Americans. Detailed data for these sub-groups on voting was not available in 2012. However, starting in January 2013, the Census Bureau has included data on the largest Asian-American groups in the Current Population Survey. Half of Asian Americans are Democrats or lean Democratic, while only 28% identify with or lean toward the GOP, according to a 2012 Pew Research Center report. In 2010 House races, Asian-Americans favored Democrats over Republicans by 58% to 40%, according to exit polls reported by CNN.